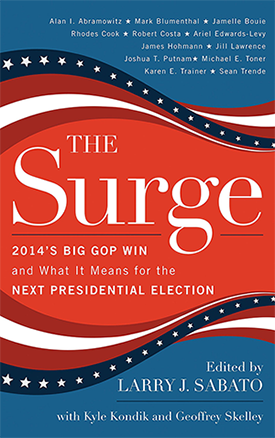 The Surge, the University of Virginia Center for Politics’ postmortem of the 2014 midterms and preview of the 2016 presidential election, is now available for pre–order. Edited by Center for Politics Director Larry J. Sabato and Sabato’s Crystal Ball editors Kyle Kondik and Geoffrey Skelley and published by Rowman and Littlefield, The Surge: 2014’s Big GOP Win and What It Means for the Next Presidential Election brings together some of the nation’s top political journalists and analysts to explain why and how the Republicans took the Senate and where American politics stands as the country’s polarized political parties gear up for 2016. Larry J. Sabato provides an overview of the 2014 election, including a look at historical election patterns and demographic voting trends. Long-time political expert and Crystal Ball Senior Columnist Rhodes Cook explores the 2014 primary season and how those nominating contests influenced the November results. Politico’s James Hohmann and the Crystal Ball’s Kyle Kondik and Geoffrey Skelley provide in-depth analysis of, respectively, the Senate, House, and gubernatorial races. Former Federal Election Commission chairman Michael Toner and former FEC staffer Karen Trainer examine the ever-growing pot of money involved in American elections and where it came from. Huffington Post’s Mark Blumenthal and Ariel Edwards-Levy follow with a look at the state of polling and how pollsters fared in 2014. Veteran journalist Jill Lawrence reminds us that despite all the talk about 2016, President Barack Obama still has two more years in office and goals he still wants to achieve. The state of the parties as they turn their eyes to 2016: Slate’s Jamelle Bouie examines the Democrats and the Washington Post’s Robert Costa explores the Republicans. FrontloadingHQ’s Josh Putnam reviews the likely shape of the presidential nominating process. RealClearPolitics’ Sean Trende, also a Crystal Ball Senior Columnist, gives an early sense of how the Electoral College may align. Crystal Ball Senior Columnist Alan Abramowitz sketches the fundamentals of the race for the White House. The Surge will be released later this month and is available for pre–order.